It is an old, old love story. Kerala and the monsoon. Come June, she wades out of the sea to hold the state in a long, wet embrace. She fills the wells, rubs out the browns, and paints everything green. She bangs the windows, scurries over the roof tiles and kicks the coconut palm in the nuts. “Did you miss me? Did you? Did you?” She scoffs at the size-zero rivers and makes them pop at the seams. Then, by September, she is off to work her magic across the country. This year, despite the red alert, people assumed that it was going to be just another flood that would kiss their porch steps and retreat. The state, too, did not expect this. In October she comes back in a different avatar and demands respect. For about a month she growls from grey skies and explodes in sheets of lightning. She blows out fuses, fries one screen too many and reminds everyone that she is a woman, phenomenally. And, just before the year breathes its last, she vanishes into the winter sunshine. We start missing her even before she is out of the door. This is not a relationship that Kerala takes lightly. There is no us, without her. Never has been; never will be. This year, the tête-à-tête began very well. The India Meteorological Department’s Thiruvananthapuram centre released a chart comparing normal and actual rainfall. The normal is a red line graph crawling across the bottom of the page, peaking in the early 30s (mm). This year is a yellow bar graph, much like the Manhattan skyline. More peaks than troughs. The highest pre-August peak came on July 16—early 80s (mm). On August 8, R. Pradeep John aka PJ, who runs the popular Tamil Nadu Weatherman page on Facebook, said: “The rains in Wayanad might turn out to be the heaviest of the year…. Even Idukki district has got very heavy rains.” The next day, three shutters of Cheruthoni were opened. The cameras showed a black-and-white image: black dam, dark grey skies, white water. While all eyes were on Cheruthoni, the monsoon rolled up her sleeves, swapped her heels for jackboots and stomped all over the state. The first indirect alert came from the chief minister’s Twitter handle. @CMOKerala tweeted that an Mi-17 of the Indian Air Force was bound for Kozhikode in north Kerala with National Disaster Response Force (NDRF) personnel. Destination: the hilly Wayanad district. The last line of the tweet reflected the situation: This is a rare event, as such operations are usually not conducted after sundown. 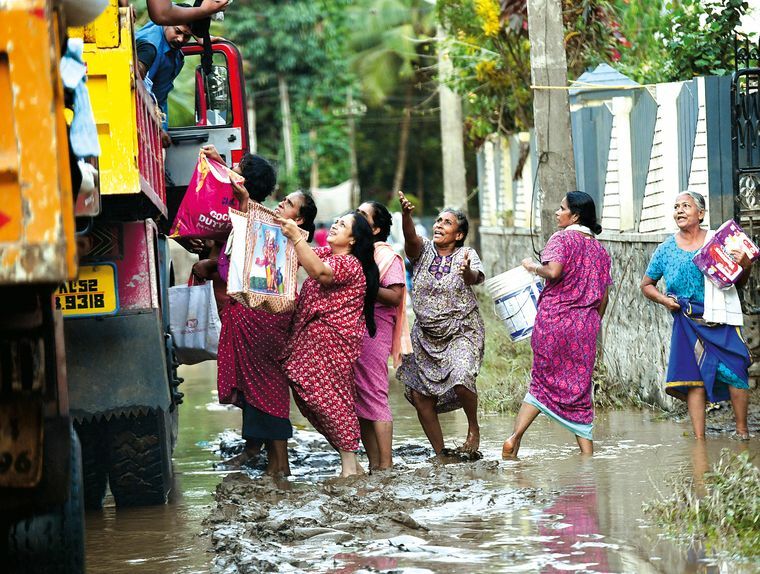 On August 10, Idukki Collector Jeevan Babu invoked section 34 of the Disaster Management Act, 2005, and declared his district out of bounds for tourists and heavy goods vehicles. Roads were caving in and rivers breaching their banks. On the same day, the Kerala State Disaster Management Authority tweeted that eight of Kerala’s 14 districts were on red alert for heavy rains. Already homes were getting flooded, and, there were boots on the ground—NDRF, the IAF, Navy, Coast Guard, Kerala Police, and the Military Engineering Services. On August 11, @CMOKerala put out the first appeal to donate to the chief minster’s distress relief fund. The next day, Union Home Minister Rajnath Singh flew down. That evening, all five shutters of Cheruthoni were opened. It was bad. But, it was nothing compared with what was to come. Between August 9 and 15, Kerala received 255 per cent more rain than normal. The result? The worst floods since 1924. All 44 rivers in spate. Water from 33 dams released. Eighty-seven major landslides; countless small ones. Eleven thousand houses damaged. India’s fourth busiest international airport shut down. Crop loss over 46,000 hectares. People rescued: 2.23 lakh and counting. Over 10.28 lakh people moved into 3,274 relief camps. Butcher’s bill: 360 and counting. 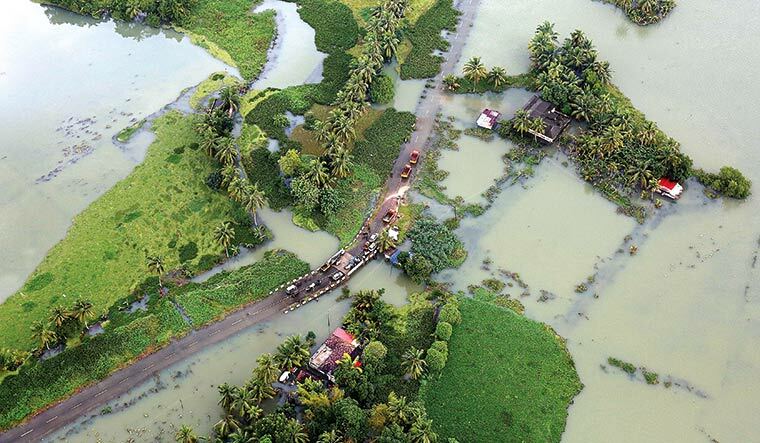 The tiny sliver of land sandwiched between the Arabian Sea and the Western Ghats had drowned. And, thanks to helping hands, Kerala today stands firmly on the road to recovery. Remember the prayer of the Iron Islanders in Game of Thrones? “What is dead may never die. But rises again harder and stronger.” From here, Kerala can only go forward. In a news conference, Chief Minister Pinarayi Vijayan said that he did not want to replicate what was lost in the floods, but create a fresh template based on learnings. As the state is stretched, the aim is to raise Rs 10,500 crore and to hike the borrowing limit from the current ceiling (3% of GDP). The Union government has sanctioned just Rs 600 crore against an appeal of Rs 2,000 crore. Surely, the state has lost, but there are invaluable learnings. For example, Ernakulam District Collector K. Mohammed Y. Safirulla had his work cut out for him because his district has a varied terrain ranging from the heavily built-up city of Kochi to 46km of coastline to parts of the Western Ghats. Swamped with calls for help, Safirulla set up a call centre model that would sort requests and hand them to the relevant section. This reporter was a Ham radio volunteer at the district-level control room in Pathadipalam. Hams worked with the police to sort requests received on scraps of paper, on WhatsApp and on air; a virtual call centre handled phone calls. By a rough estimate, the control room handled 17,000 calls in four days; 7,000 of them were SOS calls. Extraction requests went to helicopter and boat teams, supply calls went to the warehouse team and so on. Top priority requests were reconfirmed and escalated with GPS coordinates. This is a replicable model. The backbone of Kerala’s flood relief work has been the volunteer force, ranging from fishermen to school students. Last month, this reporter was in Thailand to report the Tham Luang cave rescue, and support for technical teams there came entirely from accredited volunteers. This is an opportunity for Kerala to raise a volunteer force. T. Peter, general secretary of the National Fish Workers Forum, said, “Governments should include fishermen in disaster relief committees. Kerala has 222 fishing villages. Currently, politicians are representing fishermen in committees.” One other idea: Why not a Territorial Navy? This is also an opportunity for Kerala to relook at its land use pattern. All structures built soon after 1924 stood well clear of the flood lines. Over the years, this was forgotten and the cost has been heavy. This year, despite the red alert, people assumed that it was going to be just another flood that would kiss their porch steps and retreat. The state, too, did not expect this. 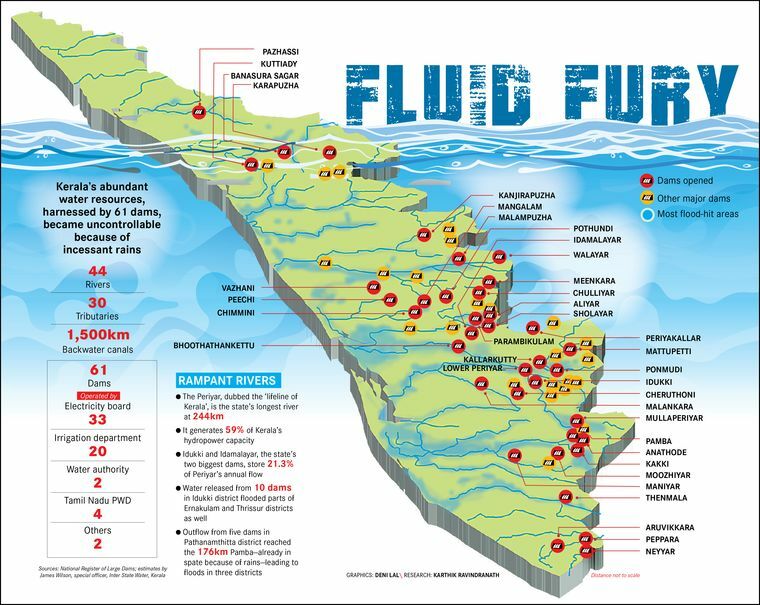 A 2017 report of the Comptroller and Auditor General says that none of Kerala’s 61 dams have emergency action plans, and operation and maintenance manuals. And, the Central Water Commission did not have a single flood forecasting station in the state. Extreme weather is here to stay; we might as well do our homework. There are learnings. There are losses. Then there are memories we yearn to forget. The senior citizen, his wife and her sister were at home when the floodwaters came. The trio were making their way to the first floor when he slipped, struck his head and drowned. The women fished his body out and tied it to a bed to prevent it from being washed away. For around 36 hours they kept vigil, until the rescue teams came. For many, this is a flood to remember. Many others would give anything to forget it.